This herb was found by the Native Americans centuries ago. Currently, Echinacea has been the subject of more than 350 scientific studies. 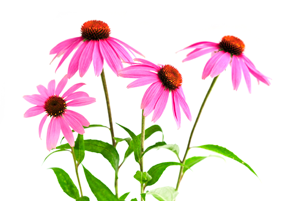 In laboratory testing, Echinacea increases the immune system’s function in a few ways. Echinacea may also have applications for certain types of infections. The most popular application for Echinacea is probably the common cold, but this herb can be used to treat chronic infections of the respiratory tract. In experiments, Echinacea preparations given internally have produced immunization boosting effects. Among others, the number of white blood cells and spleen cells is increased, and the body temperature is elevated. In addition, the results of a published study involving 238 subjects confirmed that Echinacea was safe and effective in producing a rapid improvement of cold symptoms. In the subgroup of patients who started therapy at an early phase of their cold, the effectiveness of Echinacea was most prominent. In a similar study, 246 subjects with a cold were treated with Echinacea preparations or a placebo. Those treated with the Echinacea preparations experienced a reduction of symptoms, significantly more effective than the placebo. The researchers concluded that the Echinacea preparations “represent a low‑risk and effective alternative to the standard symptomatic medicines in the treatment of the common cold. Among other benefits, echinacea can contribute to fighting ear infections and yeast infections. In one study, women who took Echinacea experienced a 43% decline in the recurrence rate of yeast infections. This does not mean, however, that Echinacea is a substitute for anti‑yeast medication. A potent botanical, with a rich history of use among Native Americans, Goldenseal’s potent properties are primarily due to the alkaloids it contains: berberine, hydrastine and canadine. These alkaloids produce a strong astringent effect on mucous membranes, reducing inflammation and also possess antiseptic effects. Like Echinacea, Goldenseal is also able to help fight infection by increasing the production of antigen‑specific immunoglobulins. In addition, Goldenseal root and other plants containing the alkaloid berberine (such as Oregon grape) may help in the treatment of urinary tract infections. Echinacea and Goldenseal work differently, but to accomplish the same goal: enhancement of immune function. By working differently, using them together is not redundant. In fact, their concurrent use in a combination formula might be expected to provide a greater overall immune response than just using one herb alone.